Love it, help my neck pain. 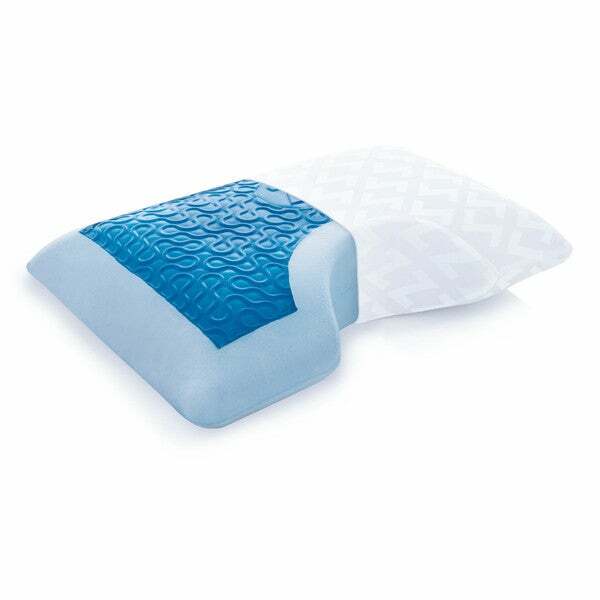 Designed specifically for side sleepers, this fantastic gel memory foam pillow offers the support and comfort you need. The pillow features a shoulder cutout that helps to keep your neck in a neutral, supported position for comfortable sleep. The Gel Dough memory foam beads cradle your head by conforming to your specific shape and weight, diminishing pressure points while offering plenty of support. The soft, moisture wicking Tencel lyocell fiber cover is removable and washable. Comfortable and certified by OEKO-TEX for comfort and safety, this pillow is a must have for side sleepers. The only pillow you need! This pillow is amazing! I was previously using a regular memory foam pillow and was fairly satisfied. I had no idea what I was missing! The shoulder cutout allows you to sleep on your side without waking up with shoulder and neck pain. The pillow keeps its shape and fullness very well. My favorite feature of this pillow is the gel inset! It keeps the pillow cool all night. I received this item for free in exchange for an honest review. A must-have for side sleepers! I am a side sleeper and I did not even know pillows like this existed until I recently tried this guy! It really is a life saver and is extremely comfortable-- It is not too firm of a pillow but holds its shape while giving that thick, memory foam feel. It is a must-have for anyone who sleeps on their side, and it gives relief to your neck and shoulders, allowing you to have a restless night's sleep. never thought that this pillow would be the slightest bit comfortable but I was wrong! With the way it fits so your shoulder doesn't touch the pillow and it's only your head it is so comfortable! I am in love with my new pillow. It is like laying on a full memory foam bed where it just takes the shape of your head and when you move it moves with you. I would highly suggest this pillow to those who have back problems because it will help with your neck and back. It is perfect for me since I love laying on my side when I sleep. My husband stol it and he won't give it back because it is so comfortable. I love my gel memory foam pillow it's nice and comfortable and my family members want to steal it but I'm glued to it I haven't had a neck or headache, it seems cooler then a regular pillow and it is firm so if you like soft pillows this is not for you! Love it. Once you get past the initial odor (by following instructions provided, which were very helpful) this pillow works out really well. It gives you enough support for your neck because of the height of pillow. I like the gel on the one side, it helps keep it nice and cool. These pillows are amazing. We've spent hundreds of dollars on pillows in the past from Mattress Firm and Columbia and these Z by Malouf are simply the best pillows I've ever owned. BF & I both slept like babies. They kept their cool all night and didn't squish down like so many other memory foam pillows - where you feel like you have an inch between yourself and mattress. Best pillow! I've done the leg work. Love all the photos the item gives you, it's exactly what you get. Great side sleeping, woke without neck stiffness for the first time in years! So cozy, cool, and memory foam gives a custom fit. 10stars!! Just received my new pillow (thanks for being so quick Overstock) and I have to agree with other side sleeper reviewers... it's just great to fit right into your pillow with no issues for your neck. It's the only pillow I need. Usually I have 2-3 pillows propping me up while I sleep but this pillow gave me a great nights sleep all on its own! Can't believe I took the time to review a pillow!! It is somewhat cool, which is nice, but what i love is that it is firm and flat - just enough for my head and neck to align perfectly. And the carve-out is great for shoulder alignment. I'm a side and stomach sleeper so those big giant fluffy one-size-fits-all pillow do not work for me. This is a heavy pillow. It won't roll around on the bed. King pillow case fits fine. Best Pillow of all time! This is the best pillow EVER! It is so comfortable! I used to wake up all through the night, but since I got this I never wake up. It doesn't lose it comfyness either! I've had mine a few months and usually my pillows are flat by this time, but not this one. I also love that it stays cool the whole night too. This will be your best purchase ever! We don't have the neck and shoulder pain in the morning anymore! This pillow works very well for side sleepers. My shoulders don't hurt like they used to. I read the reviews before I purchased this pillow. I loved it! I bought one for me and my husband. It gave me perfect support while the pillow was cool. This is the pillow to get !! Love it. Works like it states that it will. This pillow is amazing! I've ordered a 2nd one for my husband. It stays cool and is amazing for side sleeping. So far, this appears to be excellent. Like anything new it takes a little getting used to. I've used 3 nights now and I do find I'm sleeping better. The gusset was uncomfortable to me it felt like my head was in some kinda medical device or a mid evil torture device, felt weird! !, although was my first time trying a pillow with gusset but it was still weird to me, I will say that the pillow felt cold although I didn’t sleep on it because I was returning it so I can’t say if it lasts or how well you still feel the cooling once through a pillow protector if you use one and a pillow case, like I’ve gotten a coolin pillow once that felt *** cold but once I put a pillow case on it I couldn’t feel it, so idk if that’s the case with this one, anyway gusset was uncomfortable for anyone whose never tried one and is thinking it might be good, don’t waste your time, their gimmicks!!! I’m a side sleeper, so this pillow is perfect for me. It really does stay cool throughout the night. I’ve tried some other pillows in between, and always pull this one back out! I have gone through so many pillows in the last 6 months and this one is a keeper. As a side sleeper, I love the shoulder cutout. The pillows are also long enough to wrap your arms around. Since it is winter, I have the cooling part on the bottom. Will see how that work in summer. The only thing lacking is it could be a bit "fluffier", for lack of a better word. However, I am very happy and sleep very well now. "How is this pillow different from the other Z by Malouf side sleeper pillows with the shoulder cut-out, gel foam, and dough zones (available in lavender, charcoal, etc.)? Are they all the same basic pillow?" These pillows are made out of the same material, but there is an added gel layer on the top. This gel layer helps with the coolness of the pillow. I read good reviews about it and think is going to perfect for my husband ! "I need to replace the pillow case it ripped "
"Are gel or memory foam pillows hot to sleep on?" The gel memory foam will not get hot. It is designed to regulate temperature.